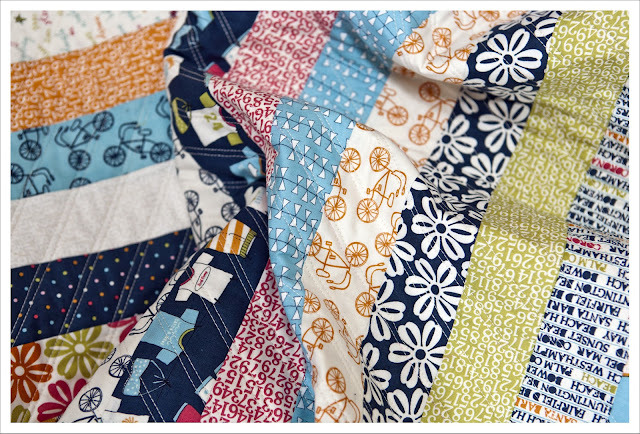 Two evenings of intense quilting and this summery quilt is finished. And I can't tell you how pleased I am with this quilt. I love the subtle warm colours of this collection and the fabric was a dream to work with (although this was a jelly role !). 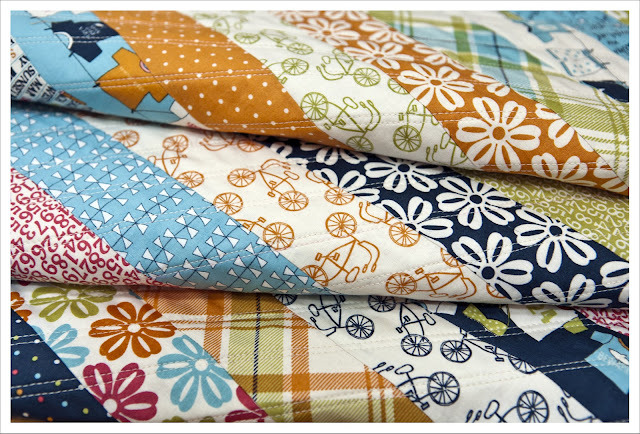 Like many of you I adore almost every collection Sweetwater produces but what annoys me a little is that they always have so many patterns in every collection. This inevitably results in me either having to restrict myself to a few prints or bite the bullet and get a fat quarter set. I did this with Hometown and although I have cut the fabric from the set for an entire quilt I still have tons left. You just simply can't do this for two collections a year. So I resorted to buying a jelly role of the 'Lucy's crab shack' collection instead and I am super happy with this decision despite the mess a jelly role creates. I think I am entering a little "striped phase" with my quilt. This is probably one of the simplest pattern you can chose (indeed if you really can call it a pattern) but I love those simple stripes so much. There is just something about them that draws my eye and makes me smile. So be warned there is more of this to come ! 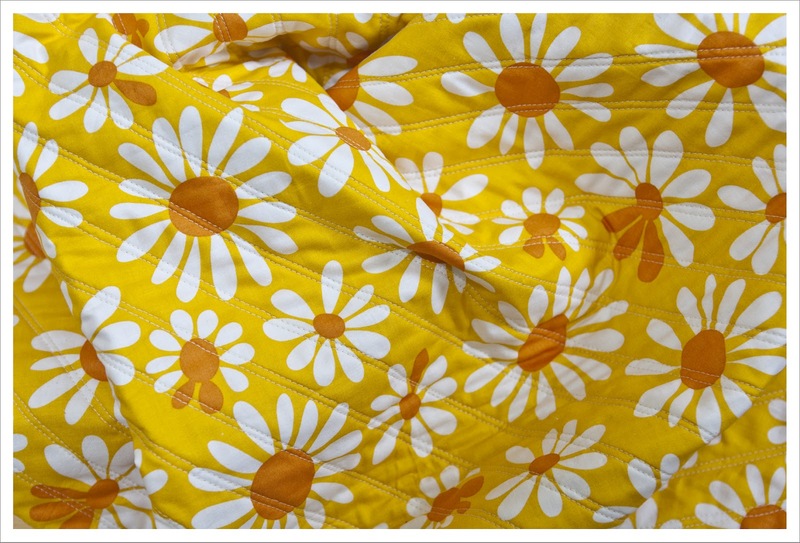 I chose a very summary fabric for the back that I bought recently in the sale at the fatquatershop (stash note here). I just think this daisy print is the perfect addition to the quilt and that's why I named it 'When Lucy met Daisy' . As you can see I quilted in diagonal double straight lines across the entire quilt. The quilting did swallow almost 6 bobbin wheels which is approximately as much as I used for the Comet quilt ! 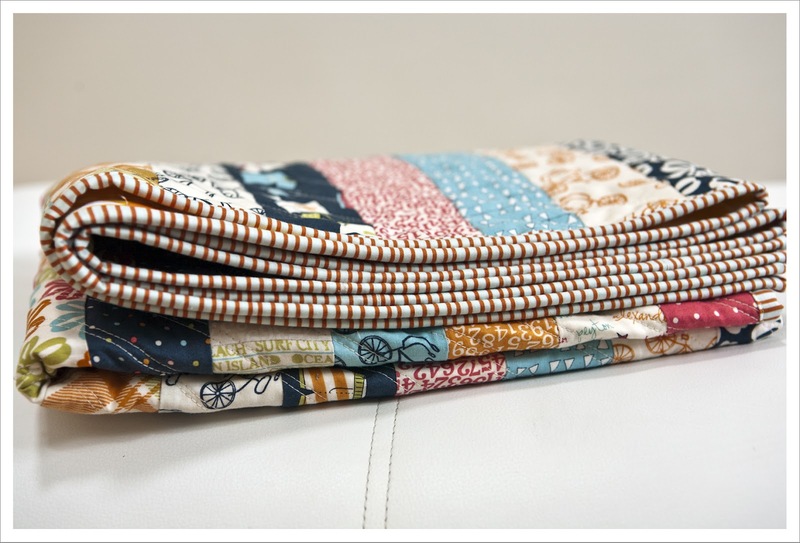 I quilted with Aurifil colour 2000 in 30 w.
And I had in my stash the perfect print for the binding. Don't you just love when that happens. This is a stripy number in orange on a light green background that fits absolutely perfect to the front and back of the quilt. The print is 'Skinny stripe orange' from the Hello Pilgrim collection and was bought at 'Sew Mama Sew' in the sale but I'm afraid I got the last bit. I will feature it in my next stash note. And last but not least a lovely role as I haven't featured one in a while. 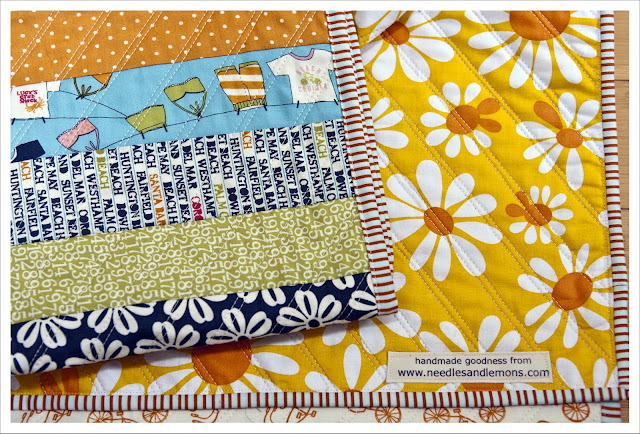 It's lovely - I love the quilting! This is beautiful. I'm afraid to quilt my quilts because I'm afraid I'll be unable to sew in a straight line! 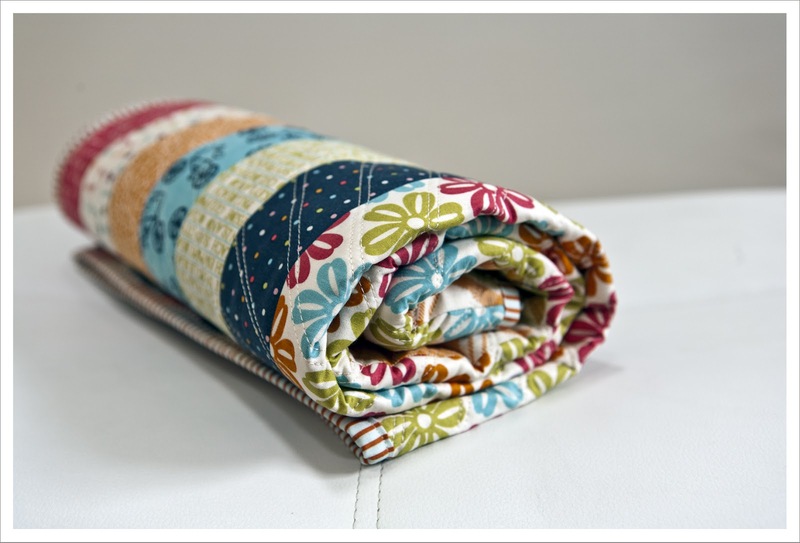 Sometimes less is more and the simple patterns work well and are almost restful to make! This is lovely and I love the binding, those Hello Pilgrim stripes are the best. Really nice job! 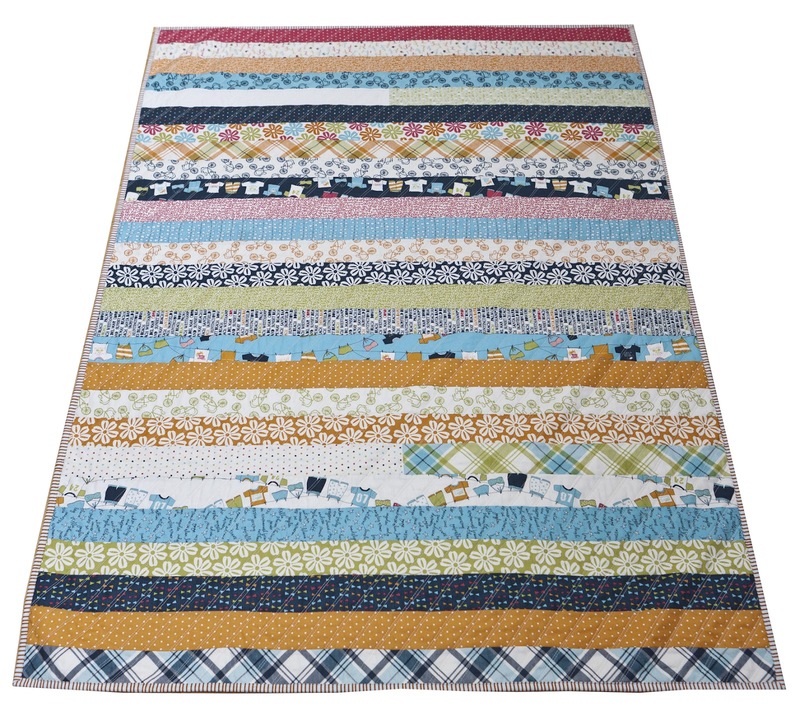 So fresh and summery - love how you quilted it on the diagonal too!